One day Country Woman Magazine searched high and lo and found this little junkin’ Canadian in the middle of a tiny town with one 3 way stop. Isn’t the www one amazing ride?! And then they offered me a challenge. This is a photo of a home inside a barn. They challenged me to share my hackfest ways on how I’d achieve the look of that room if I were to emulate it. I figured I’d do a writeup with those funky arrows and stuff, and my headshot may be somewhere on the page. Maybe. And then I got THIS. EEP! What a fun writeup this was! 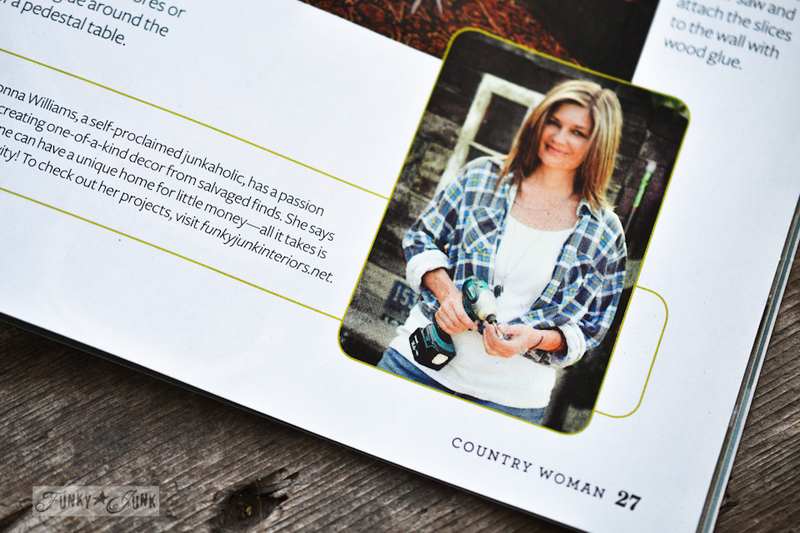 Thanks so much Country Woman Magazine, for the fun opportunity! Guys, this never ever EVER gets old. It is such a complete honour to be in print. Who knew scrounging around on the curb to find junk would lead to features and opportunities such as this? “Not I!”, said the little junker in the little town with one 3 way stop. But I’m thrilled Country Woman Magazine thought otherwise! My other magazine features are HERE. 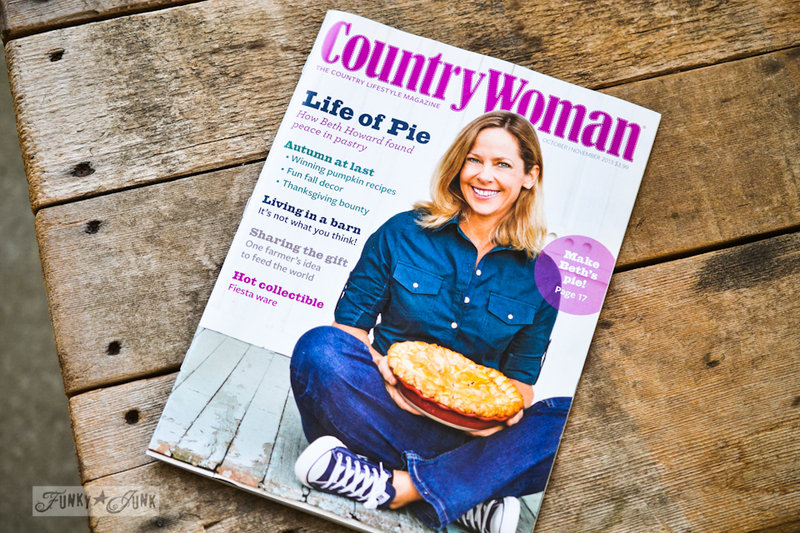 Disclosure: Country Woman Magazine did not compensate me to write this blog post. I just wanted to. Because this is really thrilling! Wow Donna, how wonderful and of course, you deserve it, I’m proud of you too, a pretty blog friend been featured and asked about your great ideas…congrats, it’s awesome! 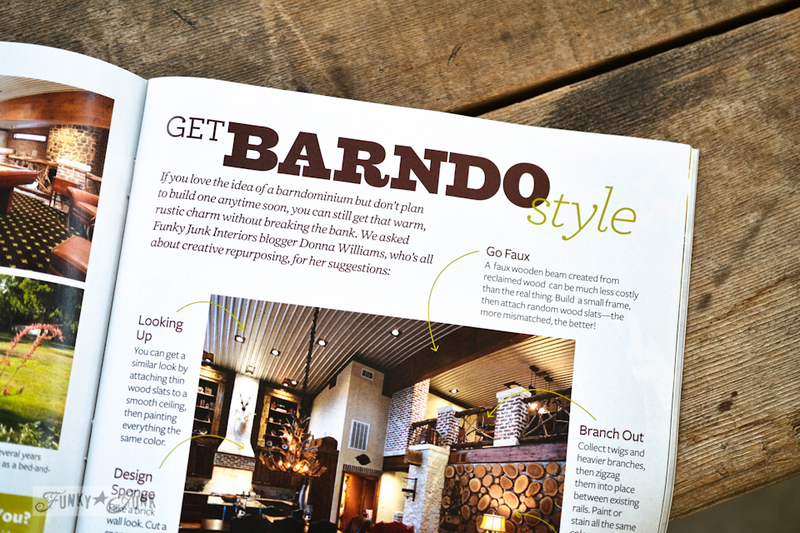 You look so pretty in the magazine, like a model, too! Have a great week. that IS very exciting! you are such fun to follow, always something very fun and exciting! you go girl! ps: the picture is not big enough! So happy that good (and fun!) things are filling your life, Donna! I am tickled for you and you deserve this~!! Congrats on your being published again. You do such amazing things with your Funky Junk. Wish I had just a little of your talent! Congratulations Donna! That is so exciting! Donna, you are amazing. I wish I had half the talent you do. Congratulations! How thrilling for you Donna! The feature looks exceptionally cool and the picture of you in the corner is fab! I agree with Rebeca though. The picture isn’t big enough!! Congratulations, Donna!!! You’re well on your way to a monthly feature somewhere! I can see it now – we’ll all be saying “hey, I knew Donna before she was a major tv star”. Congratulations! Fabulous things happen to great people! Your picture is beautiful! Congratulations, that is wonderful. I will make sure I get my copy today! Congratulations on being published again, Donna! That’s wonderful and so exciting! WE finally have him seeing the light !! wow…how exciting for you! looking forward to picking up the copy! congratulations!!! Wow!!! How awesome is this…Congratulations well deserved that is for sure! Girlfriend, you didn’t just ‘go country’, you’ve been country! Remember I thought you hailed from the Texas Hill Country until I read your bio. That’s been several years now and I’m still enjoying your country creations and your blog! Congratulations! 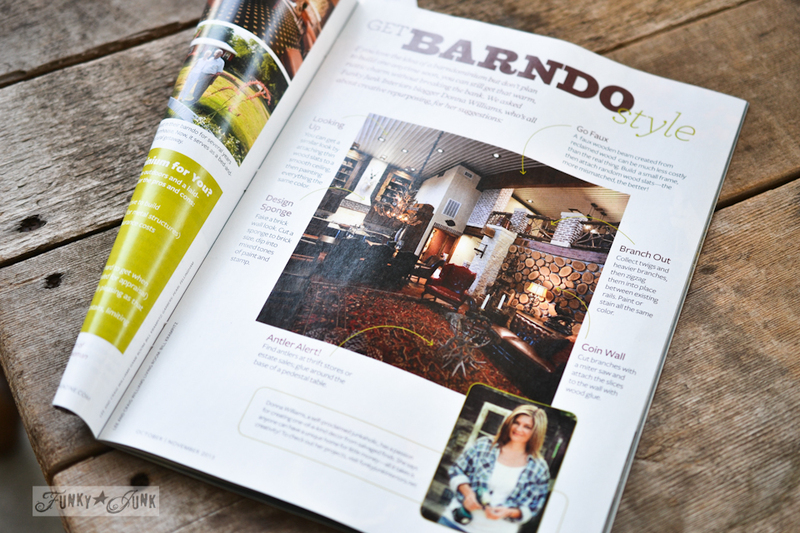 I love Country Woman Magazine, so I was delighted to see you in it. Great job. How exciting! It’s so awesome to see oneself in print! I enjoy all your junk style creating, and I’m sure many others do, too. Congratulations! Donna, congratulations . . . so thrilled for you!!! That is soo awesome! I bet you can’t stop smiling! This is my ultimate goal! You are an inspiration to us “new” bloggers! Donna, Congratulations. Ask and you shall receive. I’m so happy for you. Can’t wait to see what other accomplishments you achieve. Have a great week. How exciting!! Congrats! Nice article. Keep up the creating! Donna, how very exciting ! You are ROCKIN’ it !! Just keeps getting awesomer and awesomer !! Kudos to you !! I am so proud of you! Way to go, I know that Mom and Dad are SMILING at you. All the paper, crayons and scissors you had as a kid to make stuff paid off. You are in “Print” you deserve it all!! Congratulations Donna! How exciting! I hope to someday be as great of a blogger as you! You so deserve this honor Donna. You are the most creative and talented blogger out there! Congrats!!!! Congratulations Donna! You really deserve this. I’m sure you’ll give lots of country (and country wannabes) some great inspiration. I’ll definitely be checking out this issue of Country Woman. Congrats! How fun for you…savour every minute! I pop over here to read and get inspired for my home projects and a build soon coming up. Also, because I like to seek out finds myself since I was a kid. Congrats on the aritcle! You just rolled a Double~Double Yahtzee! YAHTZEE! Love it! I need to start using that term in real life! Donna, Congratulations! You totally deserve it because you ROCK the junkin’ world! I am so glad to see you published. You always have great advice for real people. Congratulations … that’s completely awesome! congrats you soooo deserve this. Also great pic with your signature plaid shirt ha ha . I am so glad cause it makes you look so real ;).